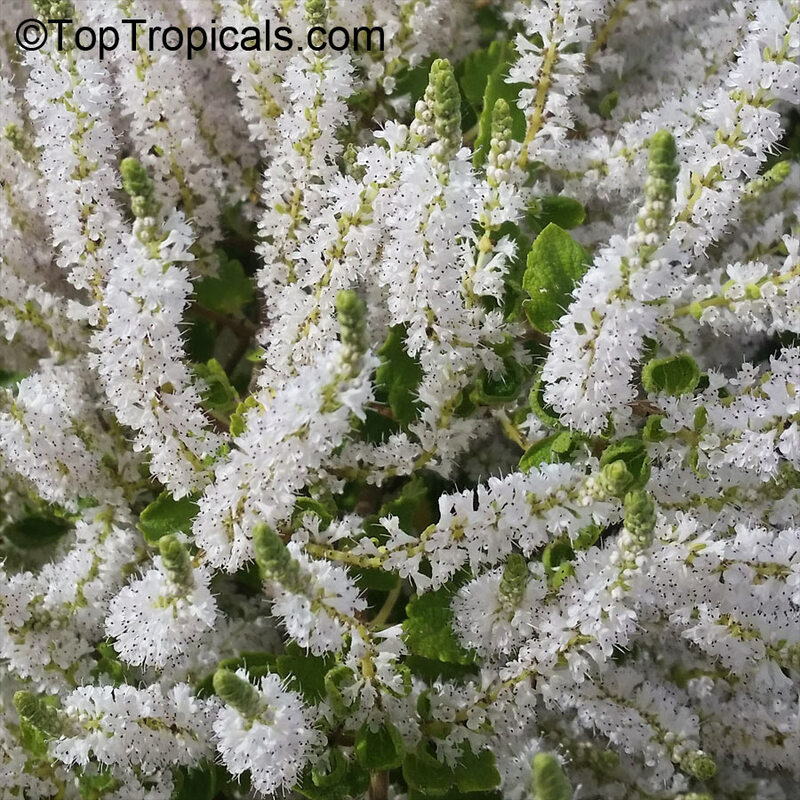 Musk Bush, Misty Plume Bush, Ginger Bush - a highly aromatic shrub with ginger-scented velvet leaves and showy white flowers, used medicinally: for respiratory (inhalations), and as relaxant (especially with item 2764 Psychotria viridis). Easy to grow, wonderful fragrance! The leaves of this tree are used to produce a herbal infusion called Yerba Mate or Paraguayan tea, a beverage traditionally consumed in central and southern South America. Yerba mate can also be found in energy drinks. Mate also contains compounds that, when extracted from green tea, help burn more calories, act as an appetite suppressant and weight loss tool, increase the supply of nutrients and oxygen to the heart, increase mental energy and focus, improve mood, and promote deeper sleep. 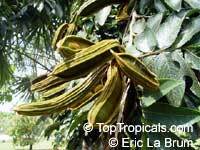 Ice Cream Bean, Inga - nice shade tree and wonderful fruit that kids love!. Fast-growing. 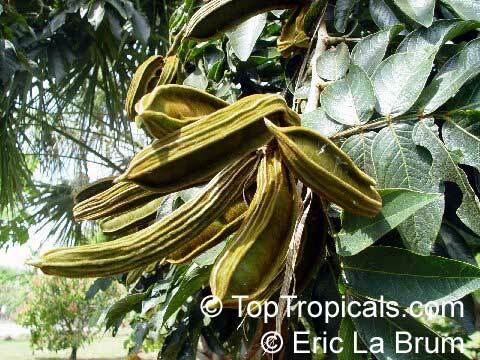 This species is very close to Inga edulis (affinis). Red belles, Burgundy Bells. An upright, medium to tall shrub with heads of burgundy flowers. Blooms summer to autumn over a long period. More flowers during cooler period. 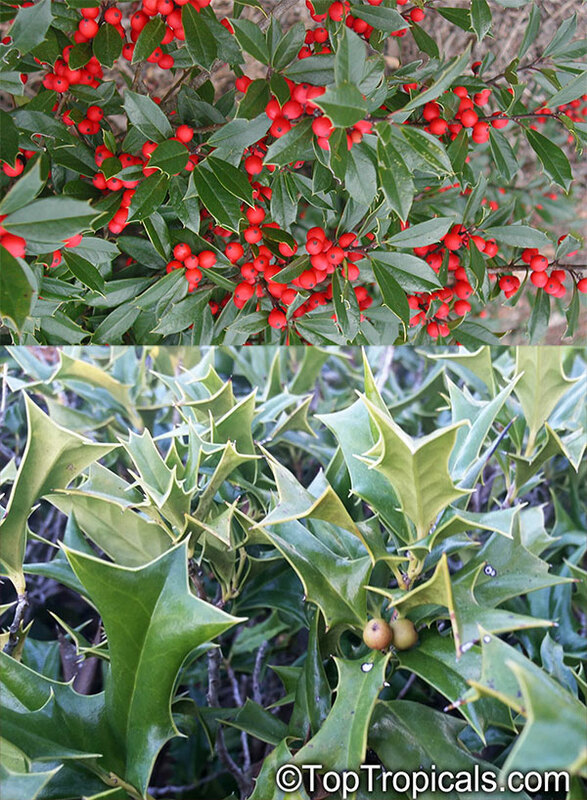 These species and hybrids are more tolerant to heat. 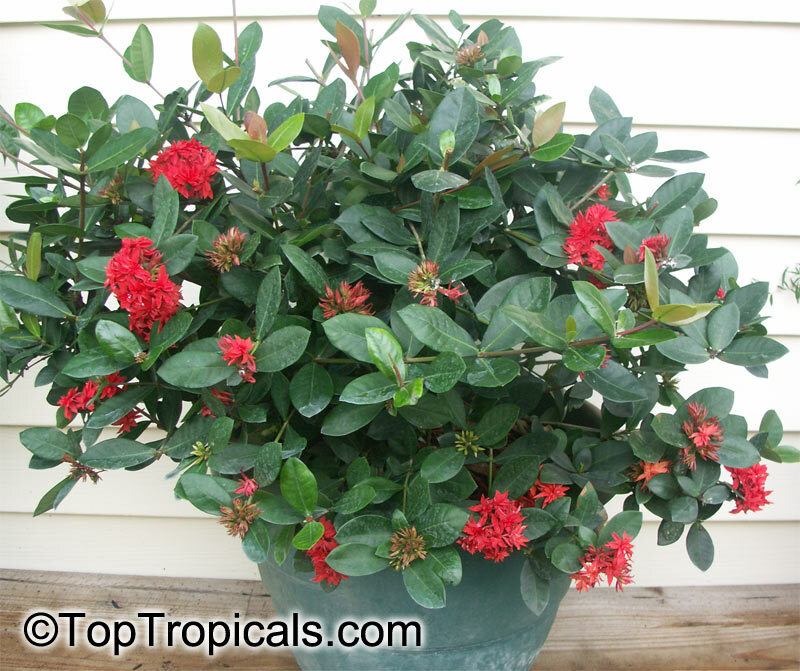 This plant is attractive to bees, butterflies, hummingbirds and is suitable for growing indoors. Purple bells. 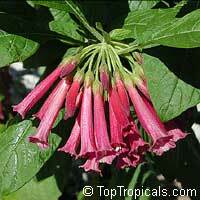 Iochroma Purple Queen. The beautiful and rare purple variety of the hummingbird magnet! 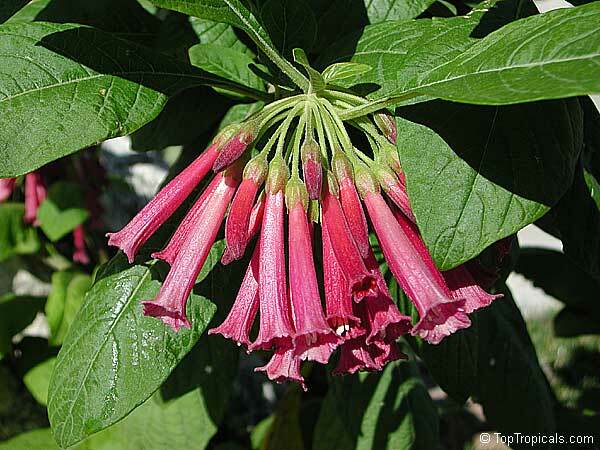 The deep, rich color bursts in clusters of striking bunches that look like mini angel trumpets. 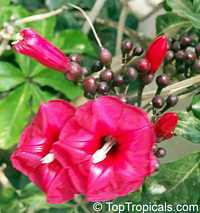 This is a very ornamental ever-blooming plant that is without question a must have for any garden, being a perfect in-ground bush or container specimen. A truly wonderful plant to admire; especially while a hummingbird enjoys! Prince Kuhio Vine. 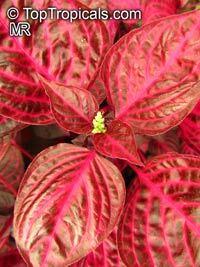 The great ornamental features are beautiful foliage and the flowers. 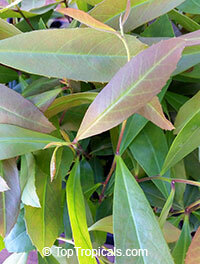 The leaves are palmately divided into five to seven segments, and are very attractive smooth green color. 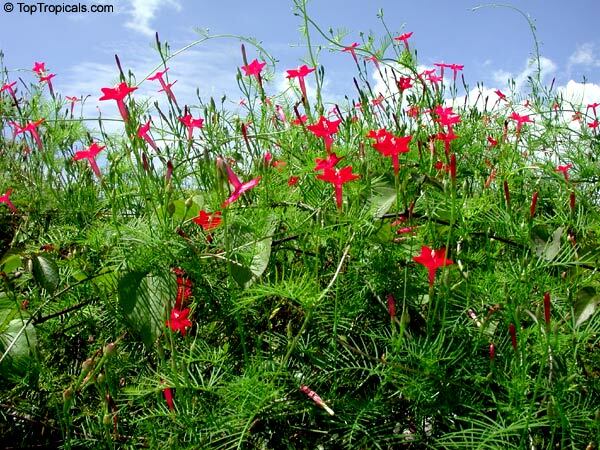 The noticeable long red-purplish flowers are in groups. Even before the flowers emerge the buds are a positive feature, because they look like small berries. 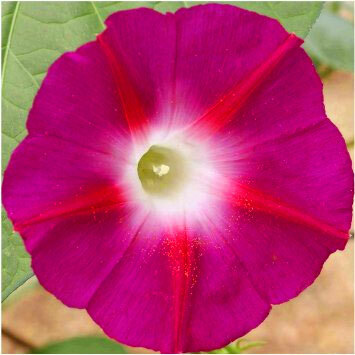 Scarlet Morning Glory. Rich, red to magenta, large, exotic trumpet flowers with emerald green heart-shaped leaves. 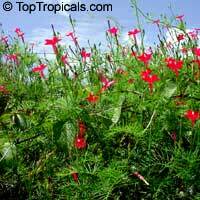 An absolutely reliable plant, 'carlet O'Hara will tolerate a large planting in a pot, surviving well amongst others. It will tolerate heat and is a splendid climber for covering trellis-work, fences etc with a dense screen of foliage, and with a profusion of large trumpet-shaped flowers up to 5" in diameter. The original Scarlett O'Hara is an heirloom variety and was the winner of the 1939 All-America Selections award. Morning Glory Grandpa Ott flowers are of intense violet-blue, with a ruby red star produced in profusion on the plant. It is a good climber for walls, trellis work or if allowed to scramble through other plants or trees. 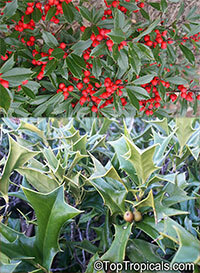 It may be grown in a warm sheltered spot outdoors, or inside a conservatory. 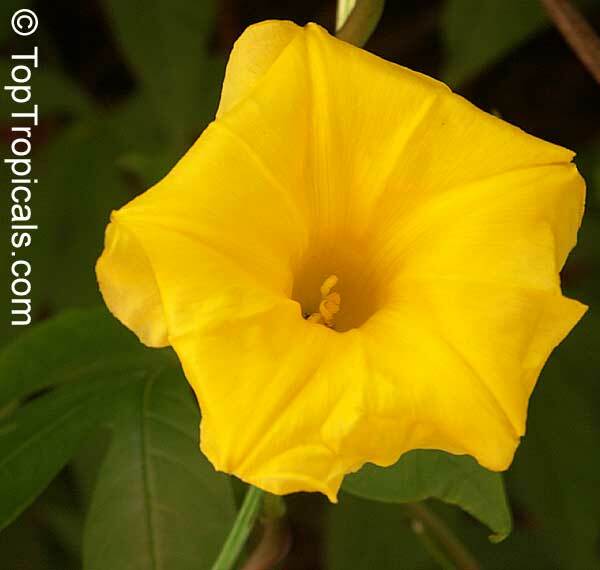 The flowers up to 3" across, close in the afternoon and are attractive to bees and butterflies. 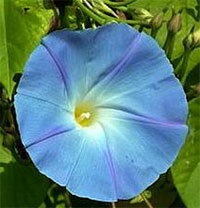 This heirloom morning glory originated in Bavaria (Germany). Grandpa Ott is one of the original Bavarian varieties that started Seed Savers Exchange. It was given to Kent and Diane (Ott) Whealy in 1972 by her grandfather, Baptist John Ott, who lived on a 40-acre farm near St. Lucas, Iowa. Cupids Flower, Cypress Vine. 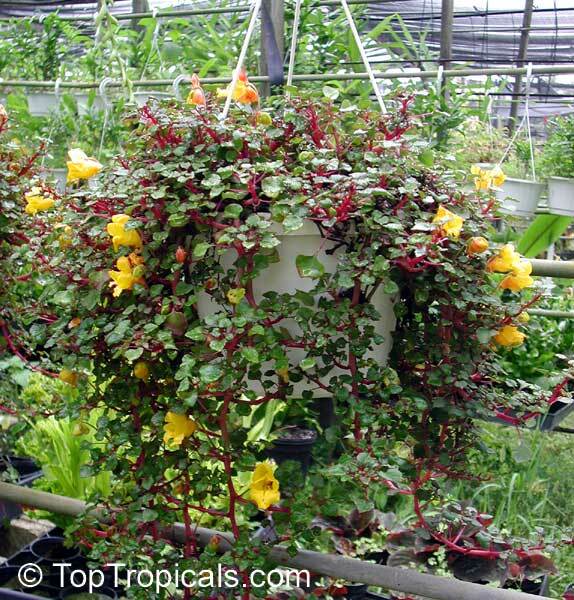 This vine with its tiny red flowers and delicate fern-like leaves, grows well on an arbor. It is a hummingbird favorite. This plant produces hundreds of flowers, self-seeding. Blooms summer through early autumn. 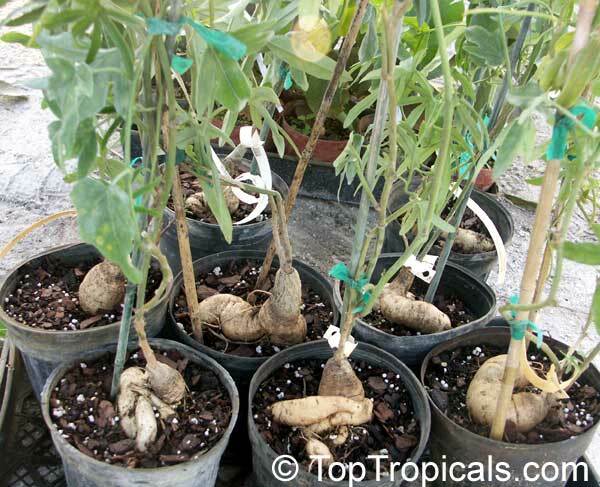 Thrives in fertile, well-drained soil. Sky Blue Morning glory. One of the loveliest of all climbers with huge trumpet-shaped flowers of deep azure-blue, the color of a Mediterranean sky. 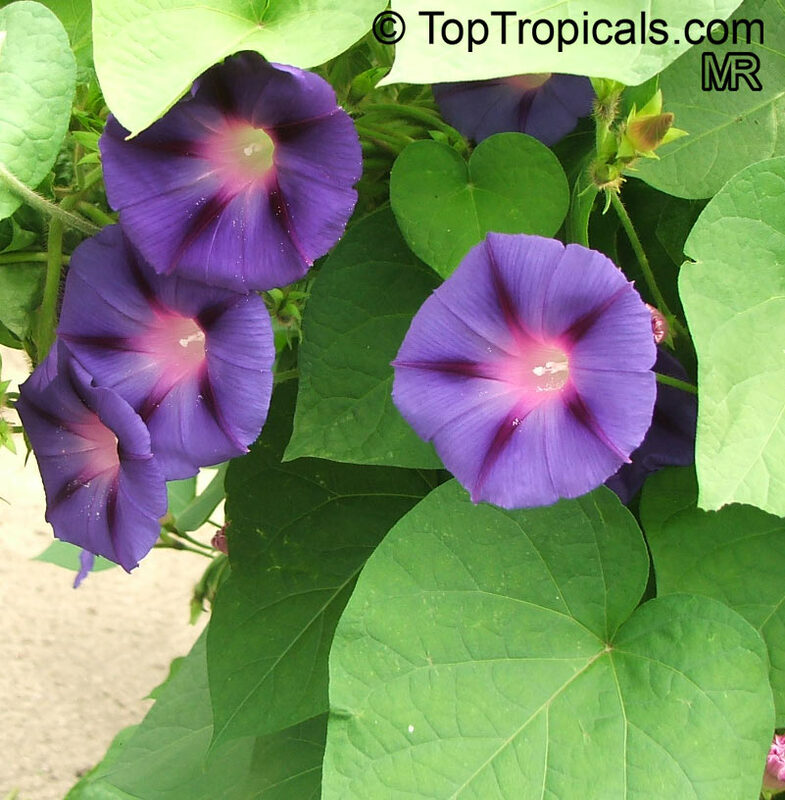 Morning glory is an appropriate name for this beautiful Central American climber. 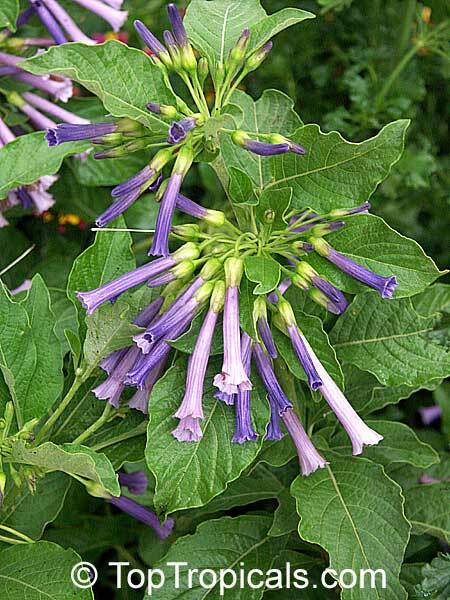 The buds of Heavenly Blue, the most popular variety, are long and tightly furled, but as the morning sun reaches them, they can be watched steadily unfolding themselves into 3"-5" wide sky-blue trumpets with clear white and yellow throats. Each flower lasts only a day, but others follow in quick succession. 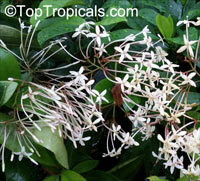 A good climber for walls, trellis work or if allowed to scramble through other plants or trees. The flowers close in the afternoon and are attractive to bees and butterflies. Ipomoea tricolor Heavenly Blue has been awarded the RHS Award of Garden Merit. Merremia tuberosa, Hawaiian Woodrose. 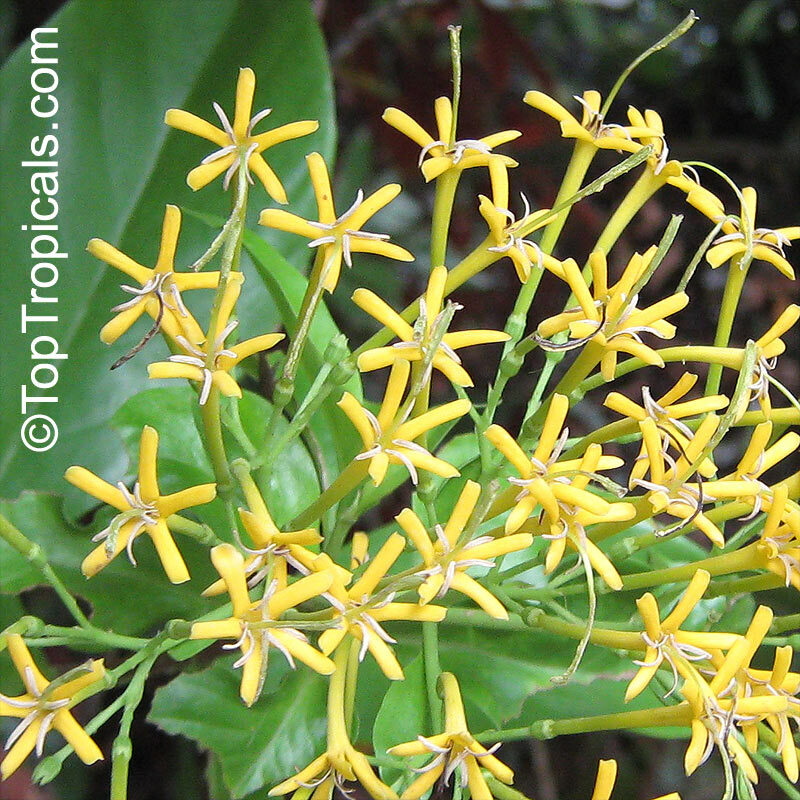 Glabrous climber with tuberous roots and yellow flowers producing fruits that when dry are often used in floral arrangements. Soak seed for 12-24 hours. Plant 1" deep. 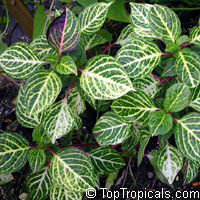 Very ornamental triocolor variegated foliage, nice indoor plant or ground cover, takes both full sun or shade. New variety, awesome tricolor variegated hybrid! A great plant in either Sun or shade. 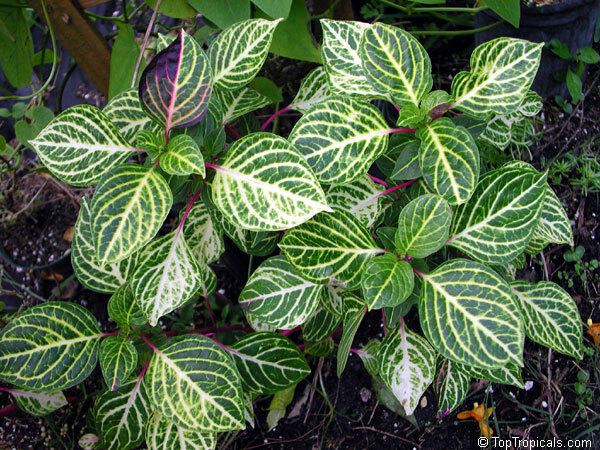 The variegated pink, green and white colored leaves compliment other plants. It needs to be pinched back often to keep from getting leggy. Tough, hardy and colorful, these showy plants with their brilliant leaves and soft stems can be a great addition to a planting. Brightest colors are generally obtained in stronger light. It makes a wonderful houseplant and a cute present. Evergreen small perennial, up to 3 feet tall. 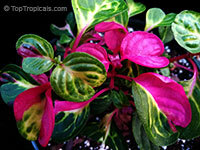 Bright mauve, old fashioned puckered foliage popular among indoor gardeners. 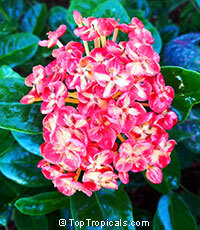 Great accent plant in warm climate gardens. 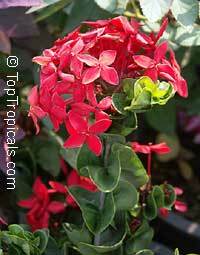 Tolerates shade and can be grown as a perfect house plant. Crimson Star Ixora, very rare, from Thailand. Triple bright red flowers. The plant is very slow growing. Perfect container plant. 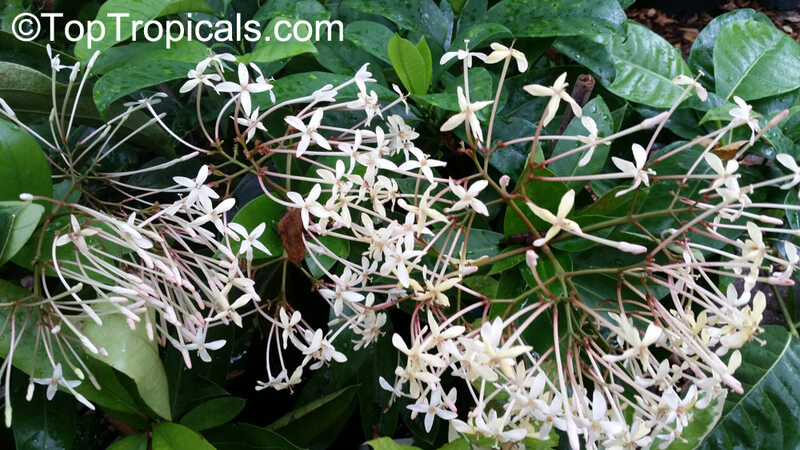 The Thai Snow Ixora is a rare and lesser known Ixora Hybrid from Thailand. It has small rounded leaves glossy medium to deep green leaves that vary from splashed and speckled with white variegation to almost solid creamy white new growth. The growth habit is semi-dwarf, maturing at around 2 feet with and a dense, tight, growth habit. It blooms in clusters of white to near white star shaped florets beginning in early summer. 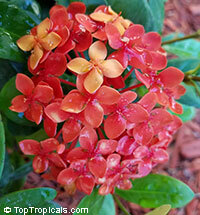 The flowers are nectar rich and attract hummingbirds and butterflies. 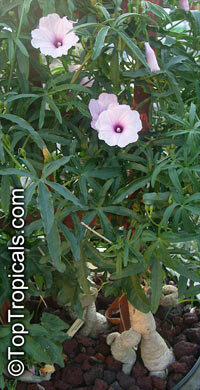 Its best and most interesting feature however is the variegated foliage and slower growth habit. This is one makes especially nice potted plants and works well as in light shade to brighten and add texture. 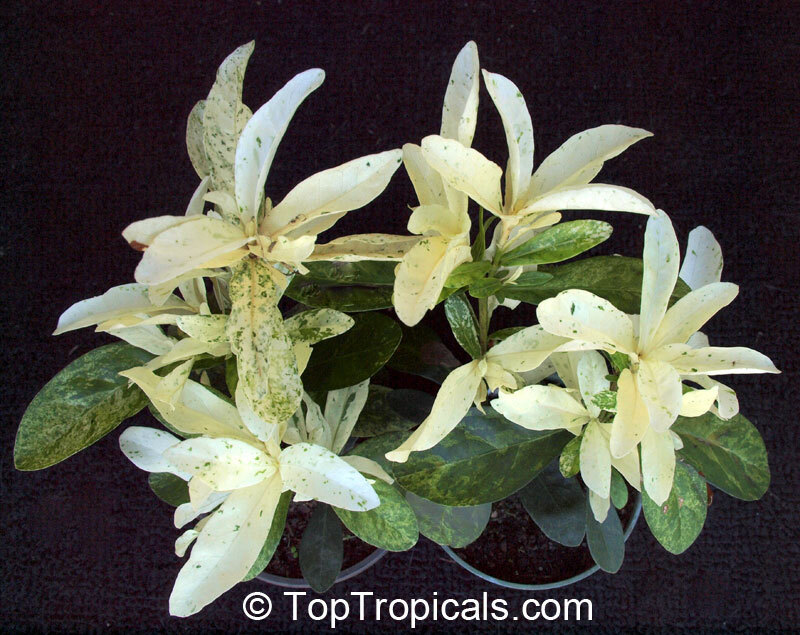 It does not bloom as prolifically and is not as showy as most of the green leaved ixoras, so the primary feature to consider when placing is the strikingly pretty variegated leaves which vary from being lightly mottled and sprinkled cream on the older to leaves to near solid creamy white barely dusted with emerald green. 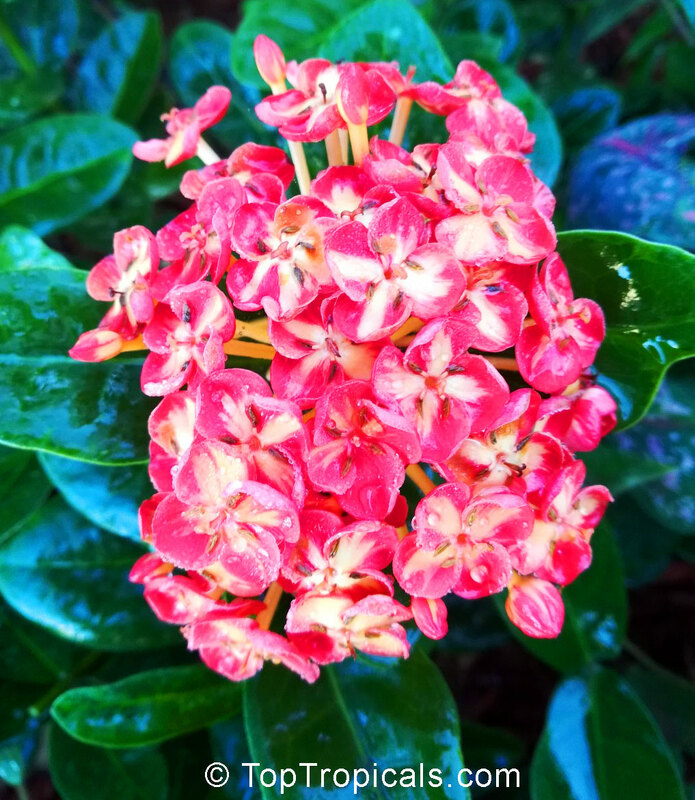 One of the most popular landscape plants, this Ixora hybrid has sunset red flowers and is extremely undemanding plant that brings you joy of flowers year around. Great plant for beginners, busy people who don't have time, or those who simply forget to water! New hybrid with variegated flowers - bright crimson petals with vanilla-icecream splashes! 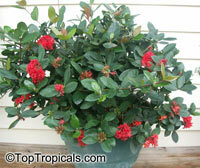 This variety is naturally dwarf and stays compact with minimal pruning, can be kept 2-3 ft tall. 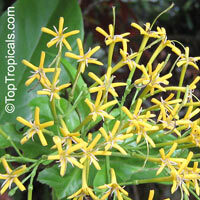 Ixoras are probably the most popular landscape plants, very undemanding and bringing joy of flowers year around. Great plant for beginners, busy people who don't have time, or those who simply forget to water!